I often wondered why they can't make a BBQ to last. At our local dump there are always lots of dead BBQ's. Mostly cheap ones but not always. I thought for sure the BBQ that my Father bought for us as a home warming gift before we even started building the new house (you don't want to know) would last. Well it cost over $500.00 at the time we got it which is, I'm thinking, at least seven years ago. It's a big heavy thing, all stainless steel and cast iron. We thought that it would be hardier than a battleship. Well, it was, for the first year. The first thing to go was one of the hinge pins for the lid. Hubby fixed it by replacing it with a nut and bolt and luckily he had another set for the other corner when that one broke shortly after. Then the igniter wires started burning off. That was annoying but at least there are two holes in the sides where you can shove a lighter in (almost like they knew we would need them). Then the burner control knobs went, one by one, getting stickier and stickier till we couldn't even turn one of them which means we can't use one of the 4 burners at all. Then there was the day that the gas line going to the extra side burner melted and then caught on fire. Hubby was just able to get in to shut off the tank before it burned the place down. Oh yeah, and the inner liner to the lid is now so rusted that we have to be very gentle when we close the lid to keep the loose scale from falling onto the cooking food. No amount of scrubbing seems to be able to eliminate the problem. In all the time we have been dealing with this stupid thing we kept telling ourselves that it would be a shame to get rid of it because of the stainless steel cabinet and the initial cost of it. However, this week one of the door hinges has rusted through and the door is just hanging off. No way we're fixing this. It's time the damn thing goes to the dump. The really sad point to this story is that it was the last thing my Dad bought us before he passed away and Hubby has been fixing it every time something breaks down on it just because it was from Dad. Why can't they make stuff to last? I guess because they have us for suckers. We really don't want to be without a BBQ so I guess it will be something to add to my side bars to save for. Sorry Dad that we have to junk it, I know you were so proud when you bought it for us. We went and bought a Napoleon bbq as we had the same trouble. Fingers crossed it may last, though I am not holding my breath. As a thank you for posting a comment on my blog on Sunday, I have posted a link back to your blog on my Monday post. Your BBQ is made to last a given length of time so the BBQ manufacturer can keep manufacturing BBQ and selling them to us over and over again. I bought a good Thermos BBQ 22 yrs ago and have over time replaced everything that was steel or glass on it. It will last me another 20 yrs easely. If the companies wanted to build one to last they can. But it wouldn't pay for these companies to do so. I'm right there with you! 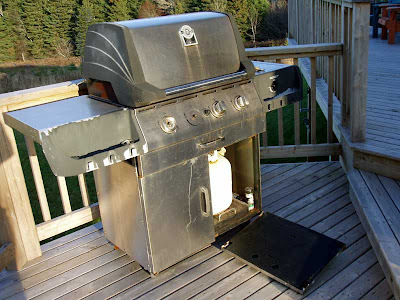 I think we all have had the same kind of story to tell about our grills! When we got rid of our last one that we had for a long long time, I swear I heard taps playing when we put it on the curb! That's sad about it being your Dad's last purchase to you :-( I hope you can find a new one that'll last much longer!